As a professional, you’ll be the trusted source for deciding what grass seed to use for a certain application, but are you well versed on when and why to use bermudagrass vs. tall fescue? Both bermudagrass and tall fescue can be used in a variety of turfgrass applications, but once we get past this similarity the two are actually quite different. A thorough understanding of these differences becomes very important to properly establish and manage each species. A side-by-side look at bermudagrass (R) and tall fescue (L). Bermudagrass is classified as a warm-season turfgrass with a C4 plant metabolism. This means bermudagrass grows best when temperatures are between 75° F and 95° F. Then, as temperatures decline in the fall season, growth begins to slow and eventually the bermudagrass will become dormant during the winter months. Tall Fescue is classified as a cool-season turfgrass with a C3 plant metabolism. Fescue’s optimum growth range is when temperatures are between 55° F and 75° F. During summer months when temperatures are higher than the optimum range, growth slows and turf can become more susceptible to disease and insect damage. Both take about the same amount of nitrogen fertilizer each season, however, the timing is quite different. It is recommended to apply fertilizer when turfgrass is actively growing, so this means the peak application times differ for these grasses. 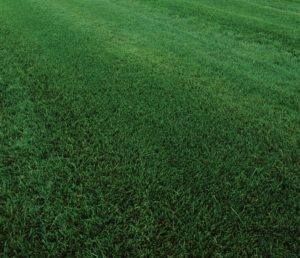 The best time to apply fertilizer to bermudagrass is during late spring through early fall, when this grass type flourishes in warmer weather. Fertilizing bermudagrass during other periods of the year should be avoided, as it won’t optimum results when compared to applying during the peak time of the year. Alternatively, we recommend applying fertilizer to tall fescue is during the spring and fall months. Fertilizing tall fescue during the summer should be avoided due to the increased severity of disease susceptance from the heat. If you desire a darker green color during this time period, a chelated iron application can be applied. Bermudagrass is one of the most widely adaptable turfgrass varieties available for professionals. It’s used in almost every application, from roadside projects to professional sports, including golf courses and football fields, to lawns. Our focus on research and innovation has allowed us to craft these top-notch products that perform for professionals – you can learn more about our professional products here. In the southern transition zone, tall fescue can be used in shady sites where a warm-season turfgrass will not perform nearly as well. In the transition zone and north, tall fescue is utilized in lawns and limited sports field applications. 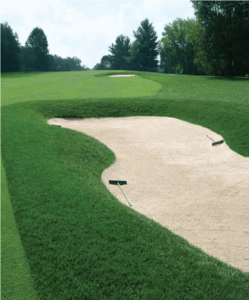 When it comes to sport applications, it is most often used in rough areas on golf courses. Tall fescue is a great choice for professional uses – especially on golf courses. 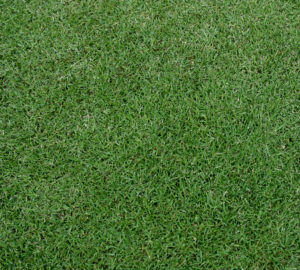 Bermudagrass is dark green in color and grows to a maximum of about two inches in height. This grass is identifiable by its coarse texture and above ground roots known as stolons. You may also notice that it has small hairs where the leaf blade meets the leaf stem. Tall fescue is also dark green in color but can grow to about three to four feet if left unattended. Compared to blades of bermudagrass, tall fescue can be identified by its wide leaf blades that have equal-sized veins running parallel on the leaf. It has no prominent central vein, also known as a midrib. Which grass type should you use? There are several factors to consider when selecting a turfgrass variety. Selection should be based on the quality of the seed, site conditions and level of desired maintenance. A representative from Johnston Seed Company can discuss your unique situation and recommend which grass is best for your application. Contact us today to learn more about our top-rated bermudagrass seed – Riviera – or our top-rated tall fescue seed – Barenbrug RTF.